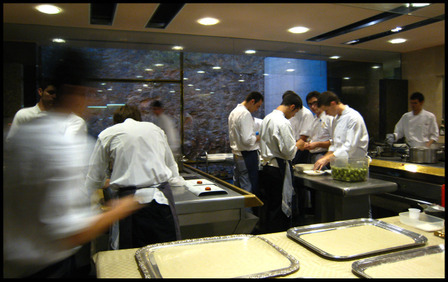 u m a m i: El Bulli, Spain. Before the trip, people asked me how I felt about going to the top restaurant in the world. I told them I worried that I won't like the food which sounded too experimental and weird. Still, out of the 30 plus courses, surely the odds are in our favour, or is it not? Initial impression, after disembarking from our maxicab ride up the dizzying drive up to the restaurant and taking quick photos in the rainy early evening, was that we stumbled into a laboratory. We, as in me and husband, Josh and Sui Mai and husband who had driven up to Roses from South of France the same afternoon, were in the kitchen where many white-coated men stood over metal tables poring over their creations. All was silent, the only sounds coming from our excited chatter and cameras clicking away, the men in white throwing occasional curious glances our way. There was no familiar kitchen smells of soups simmering away or sounds of chopping, only quiet concentration as they wield their pincers and methodically create their plates. We had a lovely table in an ingled nook overlooking the sea and the scrubby hill slopes. The show started almost immediately, giving us little time to appreciate the courses that came at lightning speed amid exhortations of "It is very delicate, please eat immediately (like NOW!)." Course 1: Yuzu sake cocktail. Delicious. Refreshing. We also ordered drinks and fruit juices. When the foam floats to the top the waitstaff insisted on stirring the juice. I can appreciate the intention but it would have been so much better and more hygienic if they use different spoons in between glasses or let us do it ourselves. Wines ordered for the meal: All Spanish. First was Brut Nature Gran Reserva 2004. Agusti Torello @ Cava-Penedes. Next up, Gran Veigadares 2002. Adegas Galegas @ Rias Baixas. Finally, a Clos Erasmus 2000. Daphne Glorian @ Priorat. Course 2: nori-Trias. No recollection of what that was like. Course 3: shiso-soft candy. Like mini fruit-tips with its soft, jellylike bite, the shiso gives it an adult cred. Course 4: Spherical olives. Pictures all over the internet, but chaxiubao's flickr set would be my favourite for image reference. 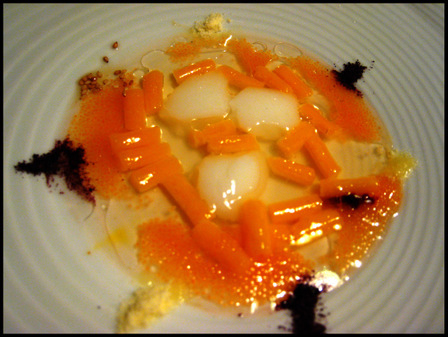 Later I would hate all the spherification dishes that would come along but this version I liked. The horrid plasticky feeling that one gets upon breaking the sphere's membrane quickly gives way to a voluptuous custardy oily liquid that concentrates all the lovely fruity flavours of a good green preserved olive. I had seconds and thirds. Course 5: Passion orchid. Very pretty edible 'flower', with crunchy waferlike petals and a pistil centre that oozed a surprise peanut-butter like cream. Delicious. Course 6: Basil leaf: Why? Course 7: "averantos": Like crispy crunch rice crispy snacks. Course 8: tomato biscuit: wafer disc infused with fresh tomato flavours. Course 10: Pekin crepes: Two versions. The crab and soya version looked innocuous enough but inside it was wet and salty. A cucumber crispy dumpling was quite delicious. Course 11: mint leaf with coconut. The coconut represented by a foamy lick on the plate. soapy. Hated it. Part 2 was macaroon-like, slightly better. Course 12: "brazo de gitano": Two plays on beetroot and yoghurt, The first a micro spongeroll confection, the second a riff on turkish delight. Taste overshadowed by clever idea. 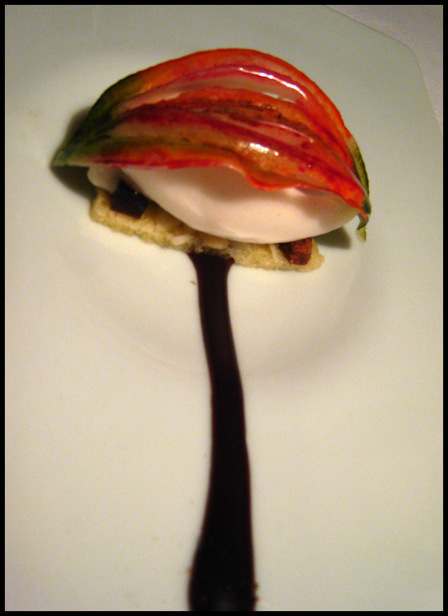 Course 13: Grilled strawberry: Somehow they injected an intense strawberry liquid inside the fruit. Yumm. Course 14: Gorgonzola moshi: I liked it. Course 15: LYO-cream. I forgot what it was like. Course 16: Buffalo milk. 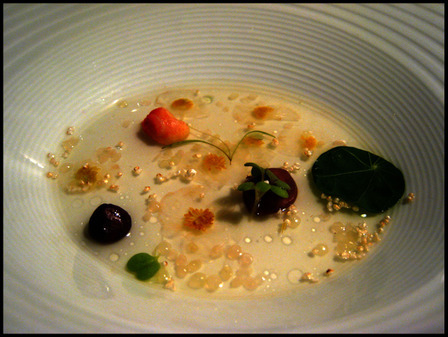 A dessert soup like dish of tiny strawberries with basil leaves and matcha powder in buffalo milk. Fun. Course 17: Razor clam/ Laurencia. Excellent. 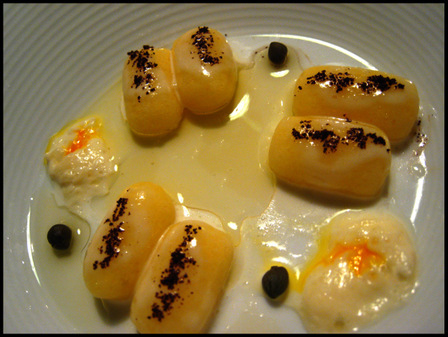 We can see where Chef Albert Raurich of Dos Pallilos got his inspiration for a similar dish at his restaurant. I preferred this, the clams perfectly cooked to showcase its fresh sweetness, the seaweed garnish and broth supporting admirably. Perhaps it is close to Chinese food, we all loved this very much. Course 18: Mandarin flower. pumpkin oil with mandarine seeds (image above). 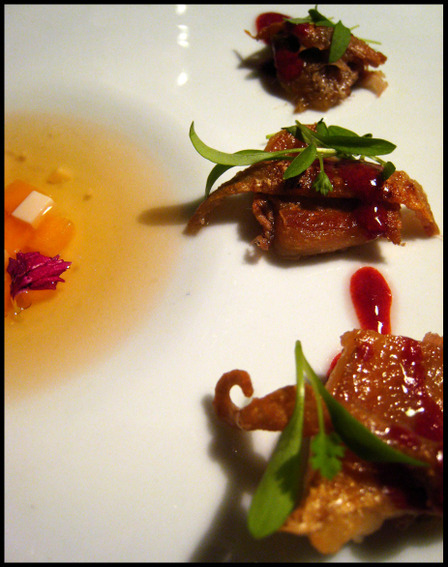 Disparate components delicious on their own, not too interesting together. Course 19: Savory / spun egg with eggyolk gnocchis. Eggy. Cold. Too much of shaped foods in plasticky membrane skin.Yucky. There was also a rendition of pasta carbonara in a spoon which was more egg yolk than anything else. Fine if eaten warm, but very unpleasant when left to cool. Course 20: Veal tendon. Similar to Cantonese style braised tendon. Course 21: Black garlic ravioli. Strange. Not garlicky but still strange. Course 22: Mussel 2008. Mussel buried under more weird sauce. Texture above taste. Course 23: Water lily. Beautiful presentation. Everything tasted good and novel. Delightful. Course 24: Game meat canapé. Looks disgusting. Taste was not much better. Texture was beyond awful. Course 25: Suckling pig tail. You can't not serve Iberico pig in Spain. Here the tail was delicious but still overwrought considering the beauty of the ingredient. The accompanying soup seemed a bit repetitive like preceding dishes. Can you tell we are all getting a little jaded at this point? Course 26: Green walnuts and endive. I liked the green walnuts well enough, but not the rest of the dish. Course 27: Gnocchi of polenta with coffee and safran yuba. When they presented this dish, I was excited. Are we getting some real food at last? My teeth were dying for a bit of action and I cannot stomach another spherical capsule of cleverness. Alas, as my dining companion informed me, for we have taken to tasting the new dishes in turn, it was yet another illusion dish, inside it was all liquid gnocchi and liquid polenta flavour, nothing to set the teeth on. I was so disappointed. With all the liquids that we ate and drank, I went to the restroom three times. At this point we are more than two thirds through the meal and we haven't eaten more than little snacks and curiosities. Me and Josh were running out of words to describe the plates that are being passed round as food. It couldn't have been easier for Sui Mai who was not feeling too well to start off with. 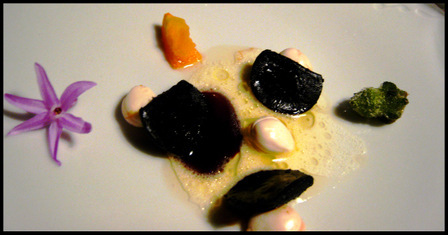 Course 28: Sea anemone 2008. But truly, nothing could have prepared me for this dish. 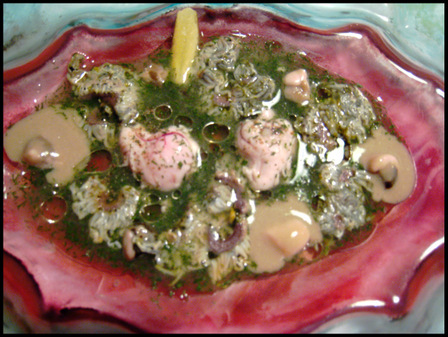 It has slimy sea anemone and rabbit's brain, all raw I think. This made the first time that I wanted to retch upon tasting something. I couldn't eat more than a bite each of sea anemone and brain. Vile. Vomitous. Nightmare! Course 29: Abalone. Good, they left the abalone alone thankfully. It was the fresh type, appropriately chewy and seafood-y. The trimmings though were nauseating. Course 30: Castanets. Actually pork rib cartilage. Looked meaty, like a mini rack of ribs, but in the mouth it was all cartilage. For goodness sake, we were paying 250 euro per head at least, can't they give us something we can chew with our teeth instead of messing our minds and palate? We get all that textural explorations already. HUsband starting to feel hard done by. Course 31: Flower canapé. Whe cares? Oh, maybe we should. This is the beginning of desserts already. Course 32: "Trufitas". Truffle-like nuggets in realistic looking soil. It was chocolate with truffles. Very nice. I had another. Course 33: Cacao. Quite ordinary compared to the rest which was a bit of a relief. The cocoa shell was made of sugar. Course 34 and beyond: Morphings. I no longer cared. Just totally glad that the roller coaster dinner was over. In short I was not too impressed by the experience. We have no regrets about going but nothing can induce me to go back. Too clever, too edgy for my taste, which was all fine if only they could try harder to make more edible stuff instead of faffing around with gelatins and membranes and tasteless wafer discs. The good side of it all was that because we ate so little real food, I didn't feel like I overate or overindulged. And that was good, because the next day was a Sunday and we had lunch reservations at a very good restaurant awaiting.